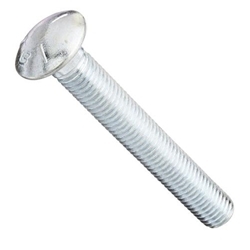 Common applications for this bolt include deck building, fence construction and outdoor furniture. They are generally pushed into a pre-drilled hole and then tightened in place with hex nuts and flat or lock washers. Available in various materials and finishes. 1/4 in.-20 x 1-1/2 in.